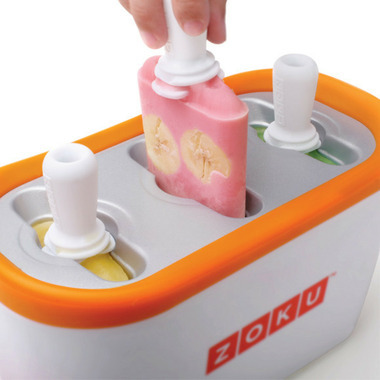 The Zoku Quick Pop Maker freezes ice pops in as little as seven minutes right on your countertop without electricity. Quickly make striped pops, yogurt pops or (for the first time ever at home) flavoured core pops. To enjoy Quick Pops at a moment’s notice, simply store the compact base in your freezer. The kit includes six durable, reusable plastic pop sticks that have unique ridged designs that allow pops to adhere securely, with special drip guards for tidy eating. 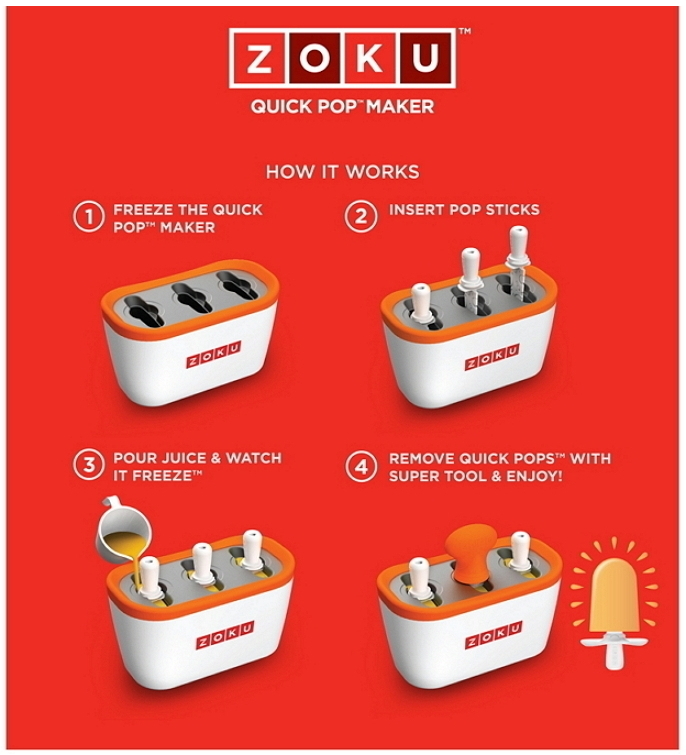 A specially designed Super Tool helps to quickly release the frozen treats from their molds. The unit can make up to 9 pops before refreezing the unit again. 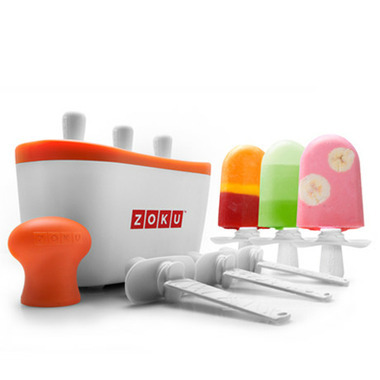 Visit our blog, The Well, to see why we love the Zoku Quick Pop maker and for a recipe for delicious coffee popsicles. Itâ€™s very good! I would give this a five star if the popsicles were larger. The sticks take up so much room as they are so large in comparison to the size of the popsicles. What a cool tool when you have kids! Great product! Only issue is the stick takes up so much space and leaves smaller pop. Wonderful product! Fun and easy way to create works of edible art. We use it everyday. I like to use the fruit and veggie juices to amp up my three young girls' veggie intake. They love it and so do I. Great product and easy to use!! recommend the accessory kit as well to include the kids in making fun treats. I'll admit, it is a bit overpriced but a lot of fun and worth it overall. I love this product. It's been amazing to have this summer. My daughter thinks it's a lot of fun. I like knowing every single ingredient that goes into what we eat. No sugar, no preservatives. Fantastic product - kids love it and so do we! Cool product. Wish it could make more pops though. I bought this to make ice pops for my son and I LOVE it! I use different flavored fruit smoothies to create designs using the tool kit and am always impressed with how quickly everything turns out. I highly recommend it for fun, summer treats! This product is great !!! very easy to use . This product is exactly as advertised: freeze the maker, insert the sticks, pour your favourite juice, milk, etc. and let it go... I used strawberry banana smoothie and they were ready in 9 minutes. The pops come out easily with the super tool and everything cleans up quickly. I love it and keep it in the freezer for treats anytime. I love how quick you can make popsicles for the kids. Great fun ideas too. I only wish it made more at one time. This product is AMAZING!! So easy to make healthy treats year round in a few minutes. Blend some berries, yogurt and a pinch of honey and you've got the best popsicles in town!! !